Fancy-work is the English term for ' beautiful handicrafts' and that is exactly what can be established in an easy way using these stickers. Fancy-work stickers have beautiful dotted patterns that can be used as a basis to embroider on paper. Each design is developed to use the most easy stitch with or a stitch to your own preferences. Combined with beads and/or brads each sticker gives a great result. Fancy-work stickers are available in a set with 10 sticker sheets or as single sticker sheets. The sets are Fancy-work Every day and Fancy-work flowers, with general and floral designs in the trendy colors candy, cream, ice, mint, violet and transparent and Fancy-work Christmas, with designs for Christmas, in the colours white, blue, green, gold, red and transparent. 1. Stick the Fancy-work peel-off onto a piece of coloured paper. 2. 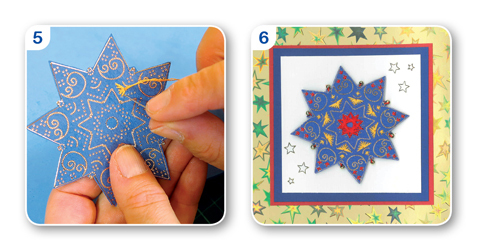 Pierce the dots of the embroidery pattern through with a pricking tool, use a pricking mat underneath. 3. Cut out the Fancy-work sticker. Take a single or double thread in your needle and stick it down on the back with a piece of tape. 5. Embroider the pattern with the desired stitches and colours.